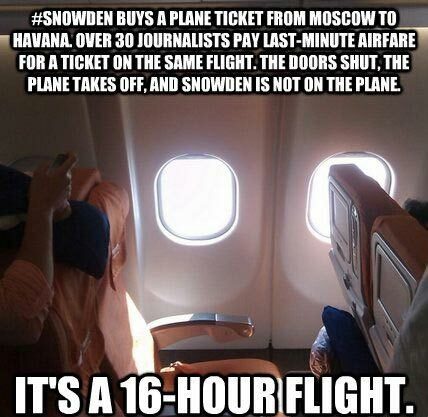 Snowden buys a plane ticket from Moscow to Havana. Over 30 journalists pay last-minute airfare for a ticket on the same flight. The doors shut, the plane takes off, and Snowden is not on the plane. It’s a 16-hour flight. Created about 5 yrs, 9 mths ago (July 2, 2013). Updated about 5 yrs, 9 mths ago (July 2, 2013).